I'm back with some more nail art to share with you this evening. 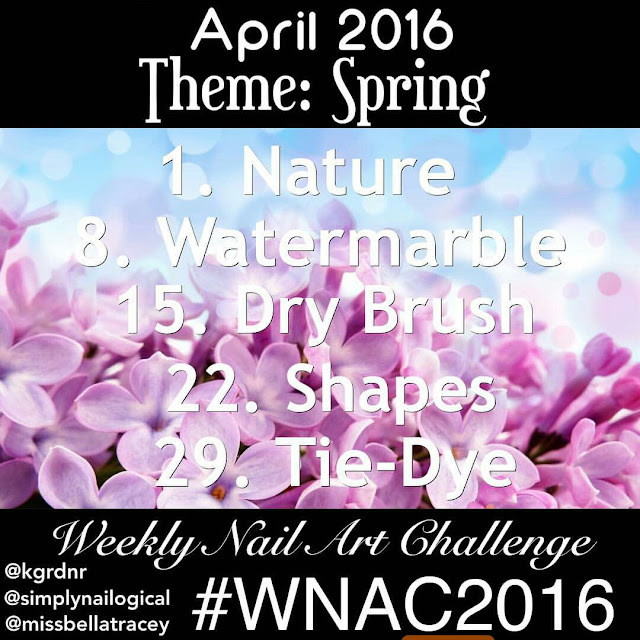 I'm taking part in this months WNAC 2016 which is hosted on Instagram by Kristin(@kgrdnr), Cristine(@simplynailogical), and Tracey(@missbellatracey). Of course I completely fell behind so I'm playing catch up lol. 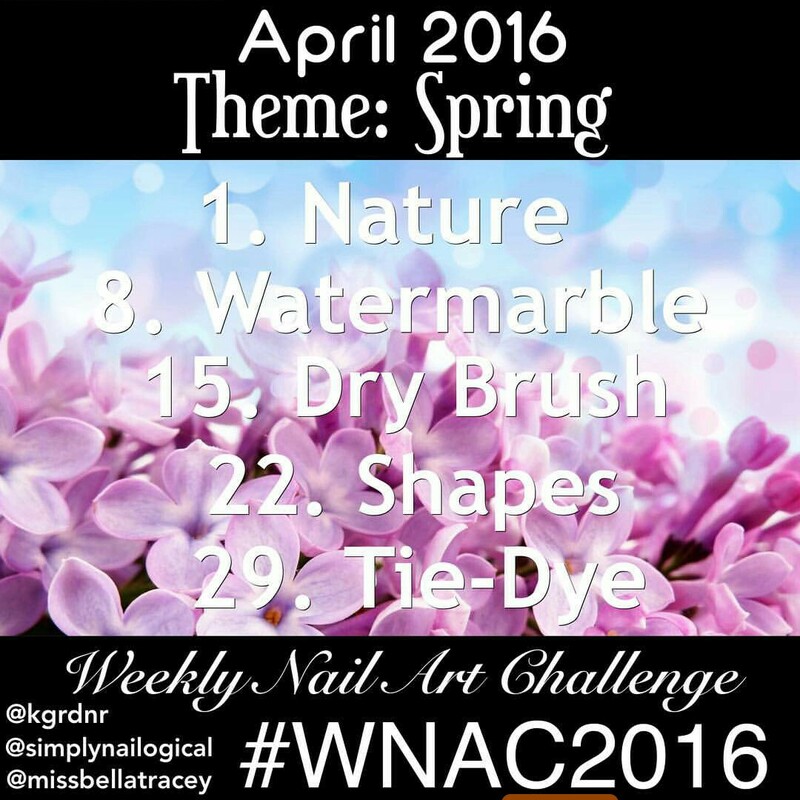 The first prompt for this month was Nature and the theme is Spring. See more after the jump! Here a look at what this month is going to look like. It's been a long while since I've done a watermarble, never did dry brush or tie-dye and I'm hoping shapes shouldn't be too difficult lol. 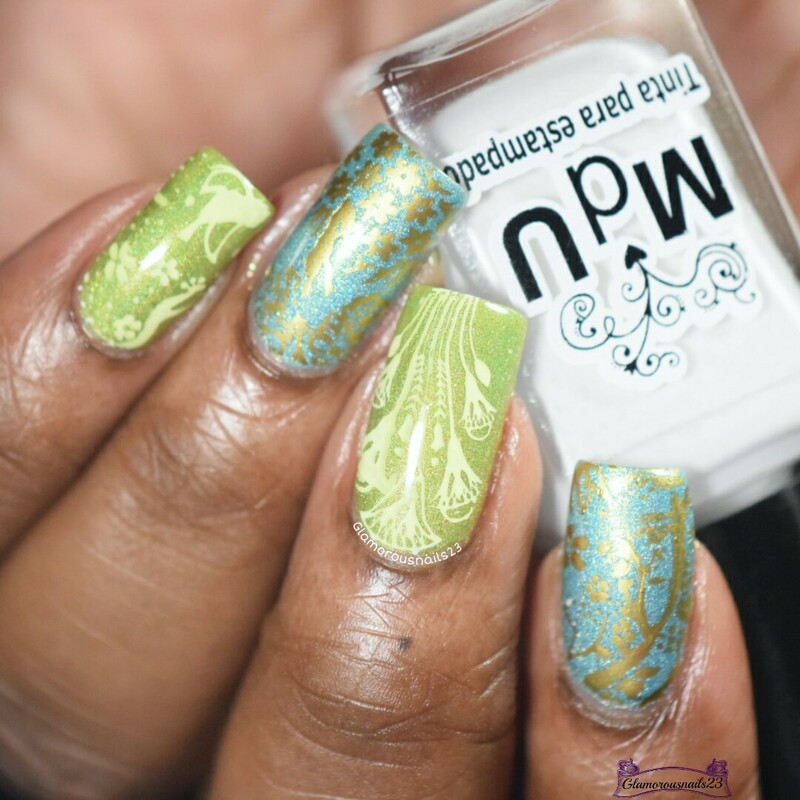 Initially I was going to do some freehand nail art but then changed my mind and went with some stamping instead. I really like how this ended up turning out the blue reminds me of the sky and the green for the grass (if it would ever get here!). Looking at it now maybe I shouldn't have used gold over the blue but oh well. Bundle Monster: BM-XL151 "Shanghai Summer"
Bundle Monster: BM-XL152 "Pharaoh-est Of Them All"
Bundle Monster: BM-XL155 "Kyoto In Spring"
Are you participating in this challenge for April? Will you be doing any other challenges this month? Has spring started where you are? Thanks for stopping by! These are so beautiful and Spring-y! Amazing job! I love the gold and blue together, these look great! What a fun color combo. I really enjoy the pairing. These look so rich together, like very expensive fabric! I especially love the blue and the gold together, but it all looks beautiful! I like the gold and blue together! It's like natural turquoise, but arty. Awesome look! I love the combination of the colors. So pretty. Spring has begun here, I'm definitely enjoying it! 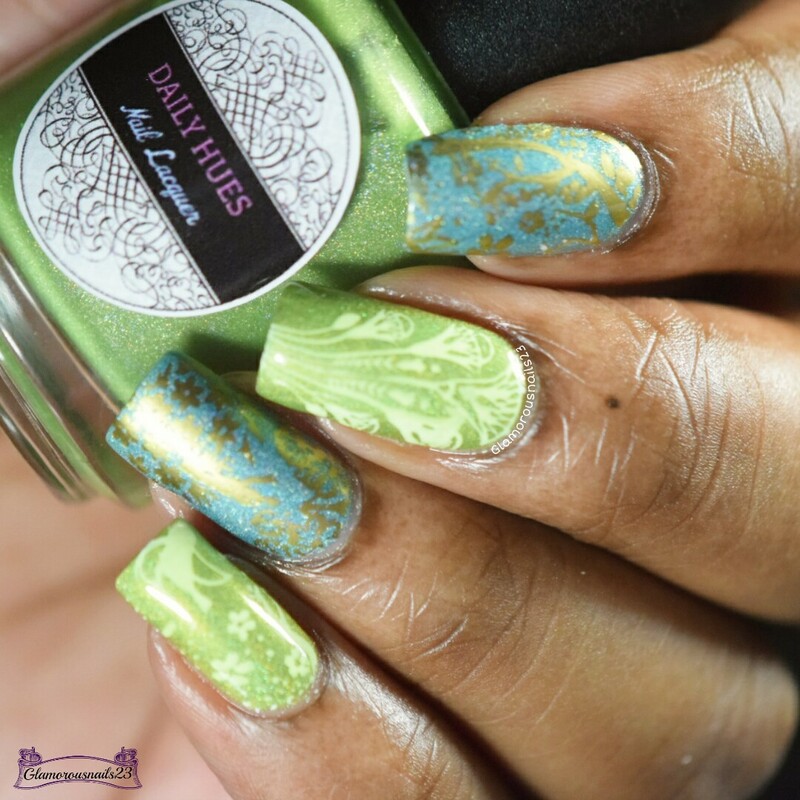 I haven't done any nail art challenges but I love checking them out and yours is fantastic! Spring is hiding over here lol. I'm hoping this week will be better! Thanks Jen! It really is pretty! Thank you! Your description is awesome! Thanks so much Cat! 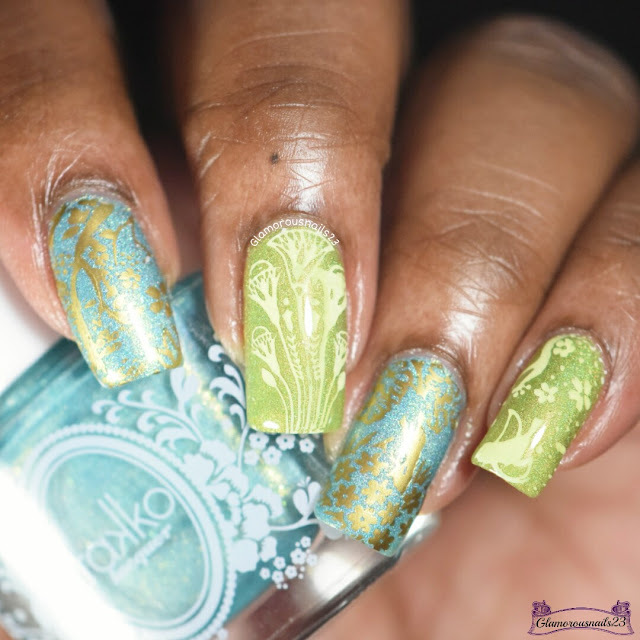 I really like this, and I love how all the colors work so perfectly for a spring earthy look!